This article is about the character. For the theme, see Scooby-Doo. Scoobert Dooby Rogers or Scooby-Doo is a Scooby-Doo figure released in 2015. He appears in a total of 6 sets in 4 different variants. Scooby-Doo is mostly medium nougat, with printed black spots, a medium azur collar, and different facial printing depending on which set he appears in. So far Scooby has four variations, one happy, one as he's dressed as a pilot, one where he's sitting, and one where he's scared. He has two exclusive moulds: one standing and one sitting. In his standing appearance his overall shape represents that of a Great Dane, upon which the character is based. He has four legs, and his feet are moulded in a manner where Scooby is able to be placed onto stud-adorned surfaces. His paws are indented to make them look more realistic, his left front paw is raised. At the top of the front legs there are two circular black spots. The hind legs have one large black spot at the top. He also has a hole-embedded stud on his back, and has a curved tail that is raised upward. 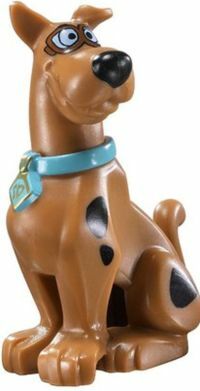 Scooby-Doo's collar is placed at the beginning of his neck, it is circular and medium azur. His initials are placed in lustrous gold printing on his collar on a triangular chain. His head and neck fits into his body at the collar and can rotate from side to side, acting as the only poseable component of Scooby. Scooby's facial printing in each variant consists of two white eyes with black pupils, thick rectangular curved black eyebrows, and a printed mouth. On the tip of his snout he has a black circular nose. His left ear is pointing up straight while his right is slightly curved downwards. In his happy variant Scooby has a closed smile printing for his mouth. In his scared variant, the right side of his mouth takes on an irregular, frightened look that displays Scooby's white teeth gnashing. There's also several lines on his face to make him look more scared. His sitting appearance resembles a Great Dane sitting up straight. He has four legs, and his feet are moulded in a circular manner around his body so Scooby is able to be placed onto stud-adorned surfaces. His paws are indented to make them look more realistic, At the top of the front legs there are two circular black spots. The hind legs have one large black spot at the top. His front paws are based in front of his hind ones. He has a curved tail that is raised upward. Scooby-Doo's collar is placed at the beginning of his neck, it is circular and medium azur. His initials are placed in lustrous gold printing on his collar on a triangular chain. His head and neck fits into his body at the collar and can rotate from side to side, acting as the only poseable component of Scooby. Scooby's facial printing in each variant consists of two eyes with black pupils, thick rectangular curved black eyebrows. On the tip of his snout he still has his black circular nose. Scooby's mouth is indented and portrays him smiling. His left ear is pointing up straight while his right is slightly curved downwards. In his pilot outfit he wears circular transparent blue goggles that are outlined in reddish brown. He has a closed smiling mouth. His sitting variation is almost identical to his pilot one, but with no goggles. His eyes are now visible and white. The right side of his mouth takes on an irregular, frightened look that displays Scooby's white teeth gnashing. There's also several lines on his face to make him look more scared. His tounge variation has the same face as his happy variant, but with a bright red tounge printed on the left side of his face. His in game appearance of LEGO Dimensions is the same as his regular physical variant par the colour. Scooby's fur is now reddish brown compared to medium nougat. When Scooby is driving or scared, he will sit down and place his paws over his eyes. Scoobert Dooby Rogers is the pet dog of Shaggy Rogers, the two are best friends and love each other deeply. Unlike most other dogs in his universe, Scoobert can speak several different languages, including English. His English vocabulary isn't great so he has to resort to sign language after around three or four words. Scoobert and his four best friends are part of the gang (himself, Daphne Blake, Fred Jones, Shaggy Rogers, and Velma Dinkley), together they solve mysteries and foil the plans of crooks who dress up as monsters to achieve their naughty plots. His friends have given him the nickname "Scooby-Doo", which most people call him, including himself. Scooby will usually stray away from the gang, he will then find a monster accidentally. He runs back in peril and tells his friends about the monster which begins the mystery. Most of the time Scooby is not willing to solve the mystery, but he stays as he's afraid if he doesn't head out with his friends the monster will catch him. Scooby generally goes with Shaggy when the gang goes searching for clues. Along with Shaggy, Scooby will usually get chased by the villain and get lost. When they get lost, they may find a clue or a kitchen, in the kitchen they will find a clue after eating. If a monster comes too close for comfort Scooby will stall the villain sometimes by mocking them or dressing up as them. During the mystery the gang may want Scooby to do a certain task, like to see if the coast is clear. Scooby will be reluctant to do such tasks but when he's bribed with a Scooby Snack he will carry out the activity. When Fred and Velma have the trap set up, Scooby will be in charge of luring the monster to come and get caught in the trap. Most of the time Scooby gets caught in the trap with the monster, though the monster will still be caught nevertheless. When the monster is revealed to be a human, Scooby will usually wander off to find something such as a treasure or a hostage. Scooby loves eating he loves all foods but clams, he strongly dislikes clams from the smell to the taste. Scooby likes eating Shaggy's food, particularly his tall sandwiches with many different layers, which he occasionally calls a "Shaggy Snack". While not in a disliking at all to human food — Scooby does prefer dog food — Scooby Snacks are his favourite treat. When eating a Scooby Snack, the taste gives him a sense of power and bravery. Scooby also likes pranking and occasionally, after the mystery is solved, he will dress up as a monster and scare his friends. Scooby is a flirt and will try and woo a female dog if he sees an attractive one, he particularly likes poodles. Besides clams Scooby strongly dislikes monsters, he is afraid of all of them. Scooby can be unlocked after placing his plate on the portal. In game he will help characters — such as Batman and Wyldstyle — defeat enemies. This is a description taken from LEGO.com. Please do not modify it. (visit this item's product page) A Great Dane with an even greater appetite, Scooby-Doo reluctantly chases ghosts and ghouls with the rest of Mystery Inc. Although Scooby-Doo is always up for an adventure, he prefers activities that end with an all-you-can-eat buffet. When his friends need him, Scooby-Doo will run to the rescue! His best friend in the whole world is Shaggy, and you can usually find the two of them running away from a monster or snacking on double-decker sandwiches in the back of the Mystery Machine. He is the first Great Dane produced by LEGO. He is the only dog to have the ability to move his head.